We started our normal trail route at the exit of Mthimkulu Reserve, right next to Kruger National Park. The effects of the January flood on the Klein Letaba River were immediately obvious.. All the reeds that were growing in the river had been washed away and the Klein Letaba River does not seem to be so Klein/small any longer. It had opened up into a wide river with beautiful white sand banks in places. There are also still sections of the river with a lot of water. Previously you would only find a few small pools with water in the riverbed. We came across a nice big herd of buffalo resting in the shade, right next to the trail. We arrived at our normal point to cross over the Klein Letaba River, intending to cross and then to continue along the Kruger boundary further up north, direction Punda Maria. However, very soon it became clear that we were not going to be able to cross the river. What in the past used to be a little two meter wide stream was now a 30 metre stream with very soft sand below which would make the crossing extremely difficult. Furthermore the flooding water had carved out a 1.8 metre wall on the opposite of the river where we usually used to exit. It is unlikely that the water level will be down sufficiently before the end of June, after which we will re-assess the possibility of a crossing. washed away and the Klein Letaba River does not seem to be so Klein/small any longer. It had opened up into a wide river with beautiful white sand banks in places. There are also still sections of the river with a lot of water. Previously you would only find a few small pools with water in the riverbed. We came across a nice big herd of buffalo resting in the shade, right next to the trail. Not being able to cross the river we had no choice but to return to the main road and cross at the bridge on the road to Hlomela village. 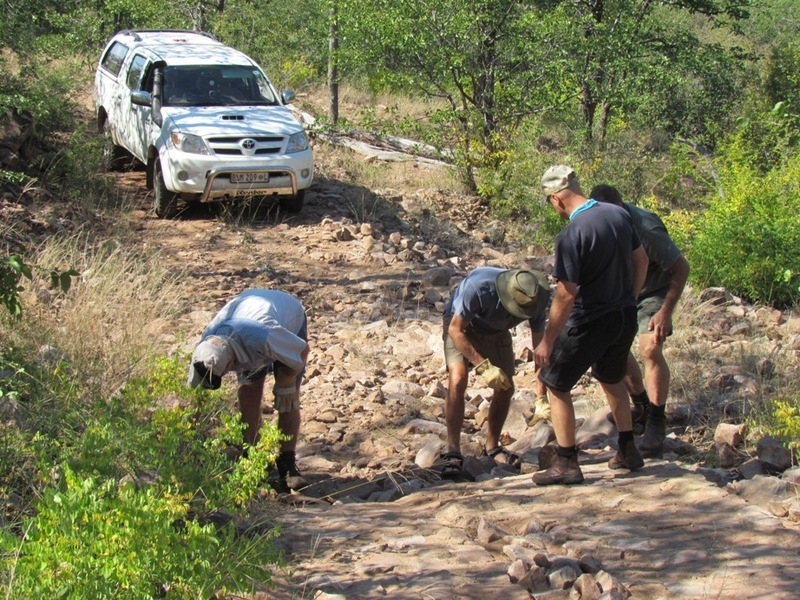 This is luckily a short detour and it’s easy to get back onto our trail track next to Kruger. 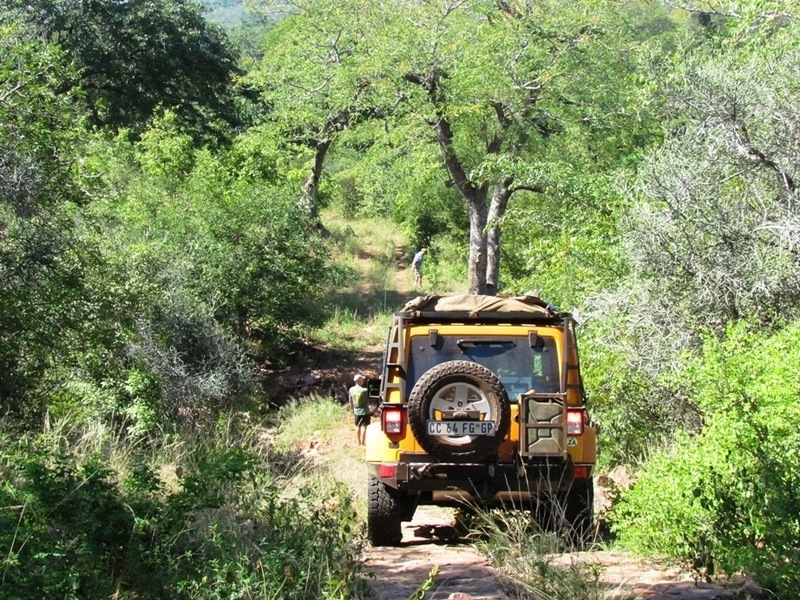 The road up along the Kruger is still in a fairly good condition. We used this opportunity to cut away and open up the road from branches of trees that have grown into the road. This was a big job and those Sickle bushes have nasty thorns. We proceeded some way before the day was running out of light and we had to find a camping spot. It was a lovely evening, with a bit of coolness in the air. A sign that winter is approaching. On day two we continued with operation ‘Tree trimming’. Zebra wood trees were now making us work and testing our cuttings shears to the maximum. By 11am we reached the point where we turn away from Kruger and the road follows some tracks through a few rural villages. We were relieved as most of us by now had a number nasty scratches form the battles with the Sickle bushes, Zebrawood trees and also a number of Knobthorn trees. It’s great knowing that we can now take our clients through this section of the trail, minimising the chance of them ending up with scratches on their vehicles. We made our way up north to the Makuya Park Reserve. 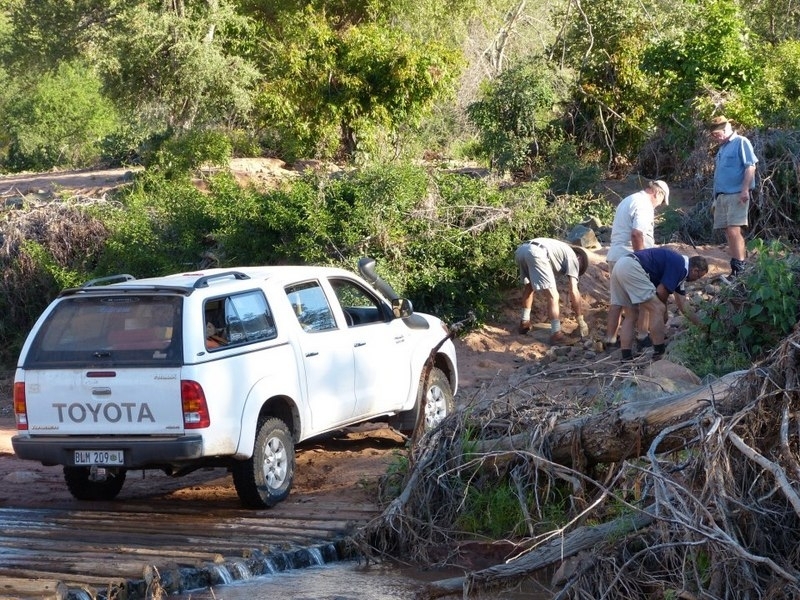 Crossing the Shingwedzi River, it was hard to believe the extent of the damage this silent giant caused in the Kruger Park and to Shingwedzi camp. But the worst part of the flooding in that area of Kruger originated in the Kruger itself with the dam wall of the Sirheni dam breaking, downstream from where we were crossing. Just outside Mhinga we crossed the Luvuvhu River for the first and immediately it was clear that this mostly gentle and calm river also had a mass of water coming down it during the January flood. Two or three smaller streams that you cross on the way to the Makuya gate showed evidence of severe flooding. In some places it was “Wow … are we still on the correct track?” as we surveyed the changes Mother Nature has given us. After ‘n lekker lunch at the Makuya gate we entered the Reserve and as usual she never disappoints. Those big old trees are all still mostly lush green. It is just the Syringa’s that have started to put on their autumn coat, a range of yellow and brown colours. And then soon you start seeing those giants of the area, the massive Boabab’s. 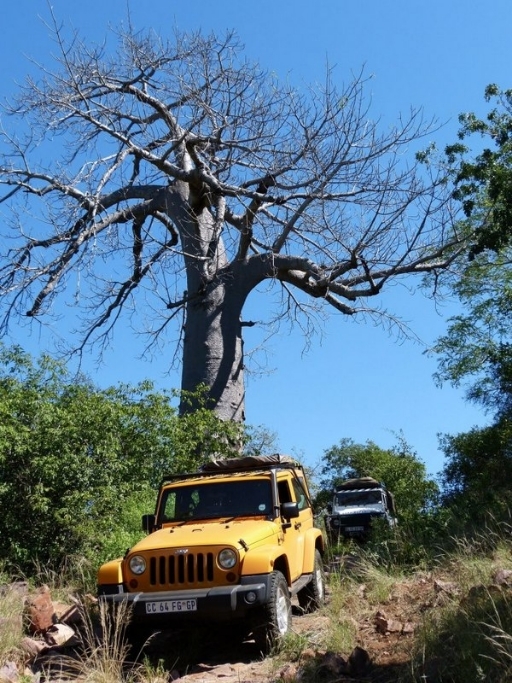 The road down to our campsite was not affected too much by the rainwater, except for the last two to three kilometres as you start your decent down to the campsite on the banks of the Luvuvhu River. Slow, however, does it. Arriving at our campsite, Lambwe, it was clear that the entire place was flooded. The result is that it is now covered in green grass. But that is nothing compared to new fresh look of the Lambwe River. It’s very difficult to believe it is the same place. What used to be a small one metre wide, almost unnoticed stream has been turned into a proper river, and even now in autumn is still flowing strongly. There was no evidence left of our old crossing point; all that is left is an almost two metre high embankment. How and where we were going to cross was luckily the next day’s worry. After a slow and lazy start to the day we were ready to face the new crossing Mother Nature left us after the floods. The first two vehicles managed relatively easily while the sand on the exiting sandbank was still firm. Then the trouble started and it became clear that we were going to have to bend our backs to build a crossing that is easier and safer. It required a lot of working down the sandbanks and removing and packing rocks. We left happy that we have left a crossing which will be a little easier to cross for most vehicles. The drivers of vehicles that are towing will, however, have to start making friend with their co-trailists from day one as they are going to need all the help they can get. Make sure those winches are in good working condition. As we proceeded on the trail we came across a number of gullies where the road had been damaged but those have now all been fixed or a new road been put in place. Again we spent a lot of time cutting away those nasty branches of trees that were hanging into the road. Our lunch stop was in the shade of some huge trees next to the river. Shortly after lunch we stopped at Masunda Cliff. Here the masses of water did a great job. It has left a big sandbank on the Makuya side of the river and created a big pool directly below the cliff. A Hippo family have since moved into the pool and it was amazing to watch the hippos from the safety of the large sandbank between us. Just before getting to the Masunda river crossing we stopped and walked a short distance to a new jewel on this trail. It is the confluence of the Masunda and Luvuvhu Rivers. What an amazing spot. 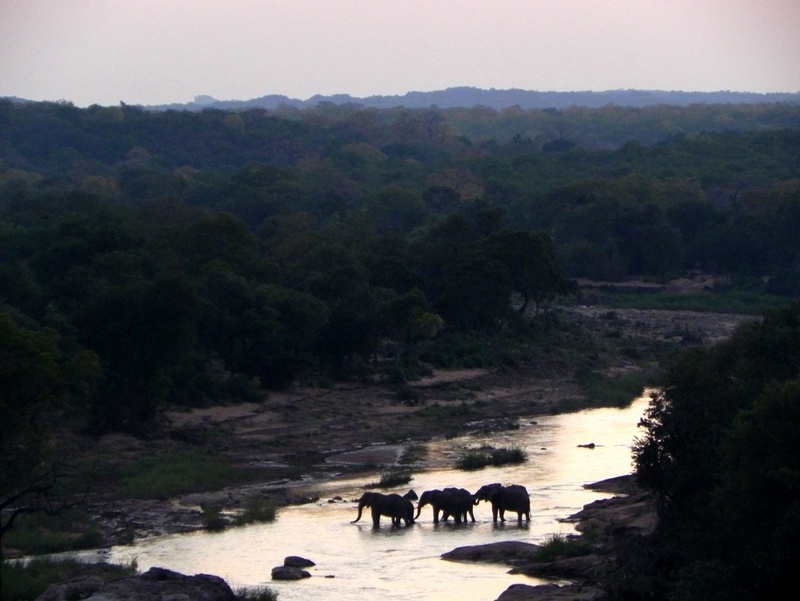 The view is dominated by large white sandbanks, two flowing rivers and massive Boabab trees on the opposite side of the river, in Kruger Park. Wish we could spend more time here but we still had some way to go for the day, or so we thought. Not much further on, we crossed the Masunda River. Previously this was a hardly noticed little stream but as was now becoming the norm, the flooding waters turned this into a wide spectacular river with some stunning cliffs. This is the first time that I have seen water here. After building a new exit ramp we were on our way again. Having started late, spending a lot of time at the Lambwe river crossing and along the way to fix the road, it was clear we were not going to reach our normal campsite. We started looking for a spot suitable for a campsite, and nobody could have predicted what we were about to discover. 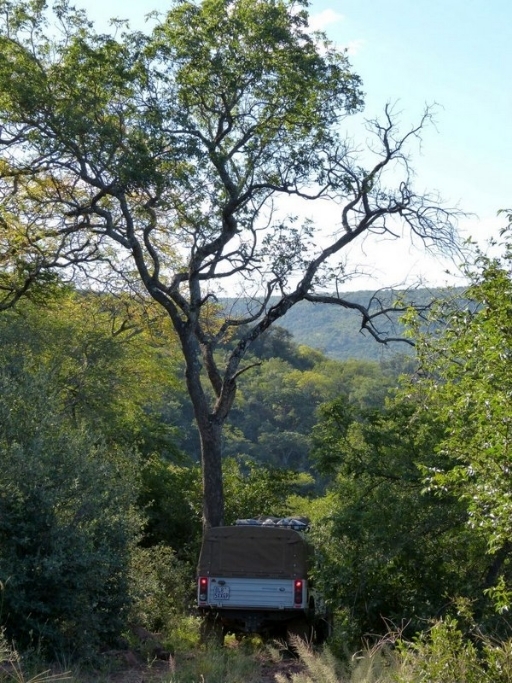 The perfect spot, with massive Jackalberry trees, a protective rock face behind you and the beautiful Luvuvhu river in front of you. And to welcome us to this piece of Eden, a large bull elephant. The perfect camping spot in the heart of the Makuya Reserve. While sitting around our campfire, discussing the excitement of the past day and our newly discover gem of a campsite, we heard some branches breaking very close by. On investigation we found that our elephant friend had come back to listen to our conversations and was a mere ten metres out of the campsite. We heard some more elephants down by the river but eventually it became quite and you were left with only the sound of the water in the river flowing past. Day four we continued as we slowly made our way to Singo Safari Camp. The rains have made the trail track a little more demanding than before but slow going does the trick. Lunch was just before Singo in the shade of a big Nyala tree. 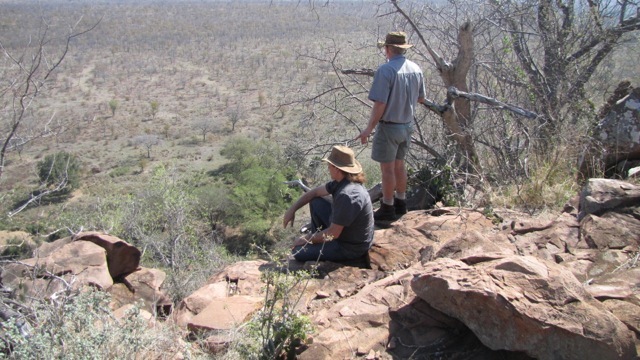 We spotted Nyala, Baboons and Impala along the way. 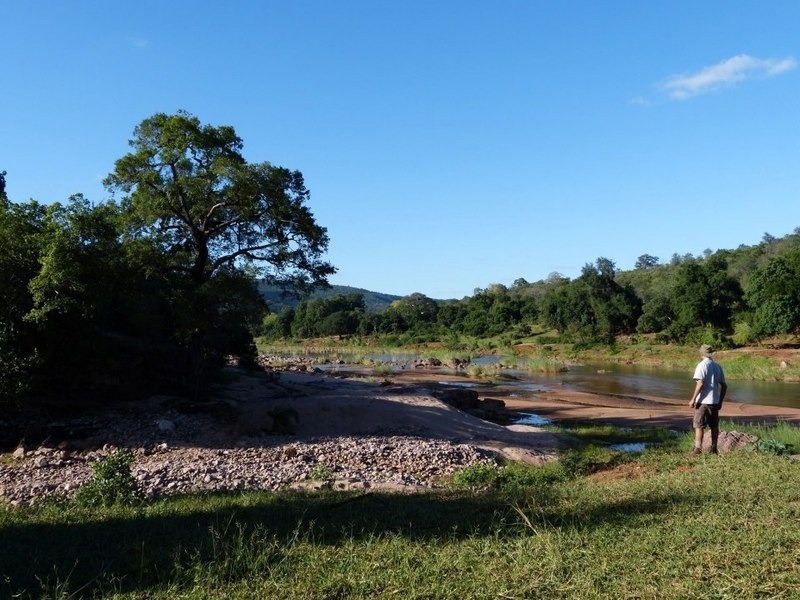 We stopped at Singo Camp for a short while just to enjoy the stunning views and to see how the flooding Luvuvhu River engraved its new flow on Mother Earth, far below. A big herd of Kudu completed the picture. We then continued to World View viewpoint, but this time on a less travelled track. This option is only for the serious 4×4 enthusiasts. Before we could descend down, what can only be described as “the rocky road” we spend about an hour to get rocks into all the holes. Notwithstanding our sweat and more sweat, it remains a serious, but good fun, challenge. And as it always goes, if you go down you at some point have to go up again. This very steep section of road is only to be attempted by experienced 4×4 drivers with capable vehicles. The last stop for the day was at the unbelievable beautiful Worlds View. All the big trees that had grown on the sand banks, left by the 2000 flood, have been washed away. You now have this massive white sandy beach directly below you. You have to see it for yourself to appreciate how beautiful it is. From here it was short drive to our campsite. 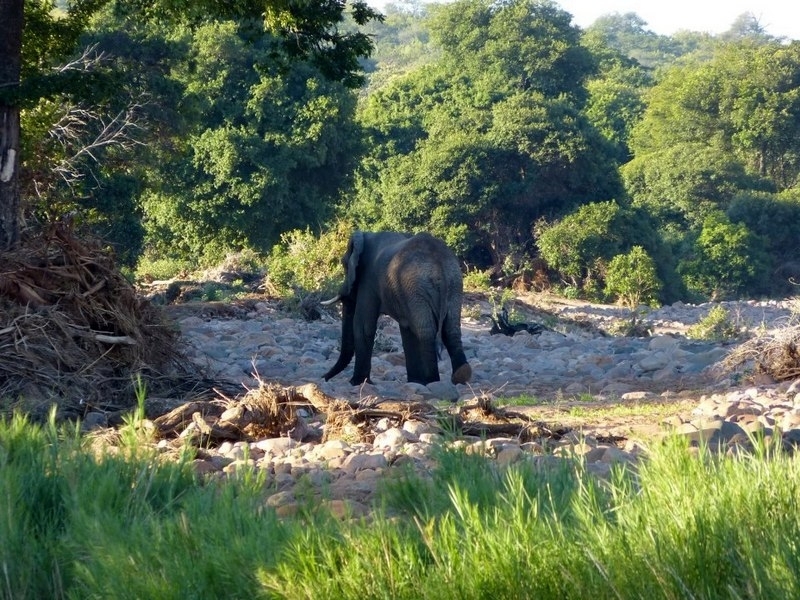 Again we had some elephant passing our campsite and also heard some Hyena calling some distance away. 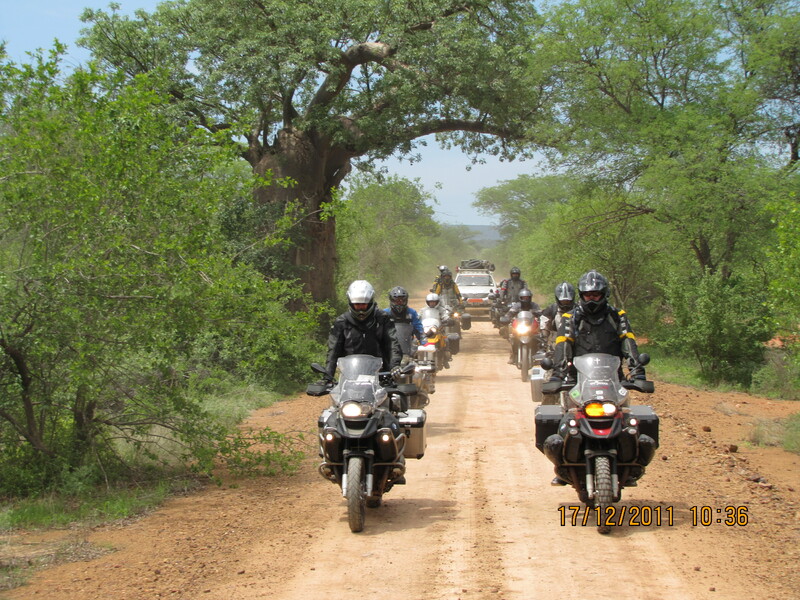 On day five we continued on the trail, making our way to African Ivory Route’s Mutale Falls camp. As was expected there was a lot of work to be done on this section as it was not used since the floods. A section of the road was totally washed away and a new road had to be opened. We eventually reached the breath-taking Luvuvhu Gorge and spotting a pair of Verreaux’s Eagles made this already special spot so much more of a highlight on the trail. We reached Mutale Falls camp at about 15h00 and immediately went down to find a place to cross the Mutale River. This relatively small river has also grown into a big river with two rather strong flowing streams. The sand on the opposite side of the river, which used to make exiting easier, has all been washed away, only leaving big rocks. We explored and discussed, and considered options and discussed more and some more. Eventually it was decided not to attempt a crossing because the possibility of ending up with a vehicle struck in the middle of the Mutale River was just too big. 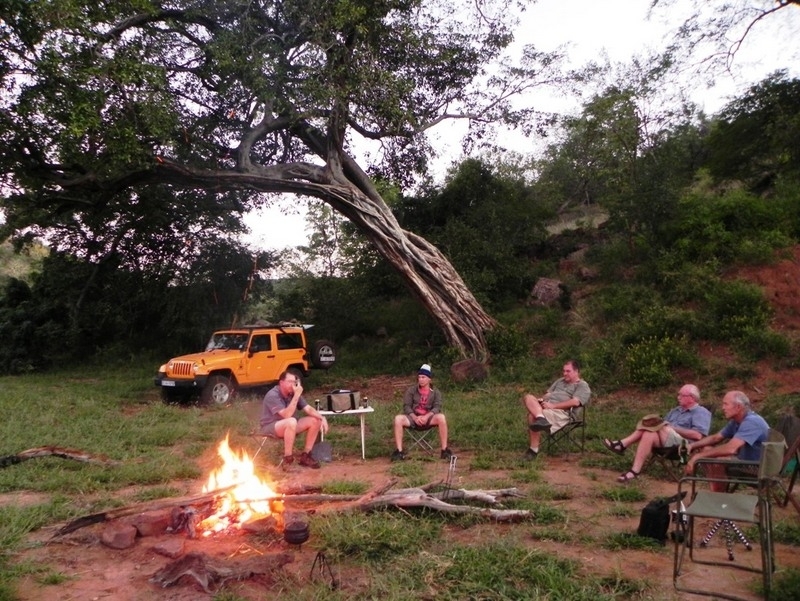 Not being able to cross and to continue to our campsite near KNP Pafuri gate, we decided to spend the night at Mutale Falls camp. What a treat to spend the last night in such a lovely camp, high above the Mutale River. With the viewing deck facing directly west into the setting sun we were spoilt by the most amazing view of a herd of elephants crossing the river in the last bit of remaining daylight. Not being able to cross the Mutale River, we had to drive to the main gate of the Makuya Reserve to exit the park and end a wonderful trail. All the hard work – building roads, packing heavy stones and battling thorny branches – forgotten. While so much has changed, what remains is a magnificent piece of Africa, waiting to welcome us again. Who’s joining me on the next trip? Click here to contact me.